In my experience, babies begin to go through a difficult stage when they are around 10-12 weeks old. They are starting to stay awake for longer and be more aware of what is around them, but are too young to be properly playing with toys, which means that they can get very frustrated. 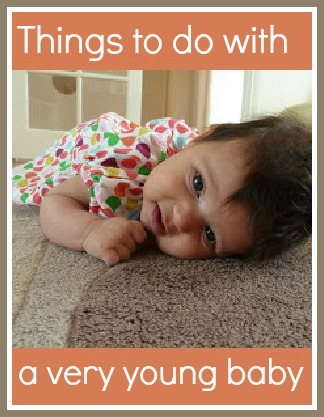 So here are some ideas for things to do with small babies that are not yet sitting up by themselves in the times between feeding and sleeping. Reading - a baby is never too young to look at books, and if you have an older child this is an ideal way to entertain them both. Read picture books and talk about the pictures, point things out, try texture books like the "That's Not My..." series. Don't just stick to books aimed at babies, also read books aimed at older children such as "The Gruffalo" or other books by Julia Donaldson, particularly those with rhymes. You can also read poetry or song lyrics, or go through a magazine and look at the pictures. Look through photograph albums and point out family members. There are a range of books called Baby's Very First Book which we loved and I've written about some of them here - books for very young babies. Singing - either traditional nursery rhymes or modern songs. Turn on some music and dance around the room with her, especially to songs with a strong beat which can often calm a grumpy baby. When singing nursery rhymes like Incy Wincy Spider or Hickory Dickory Dock involve the baby by walking fingers up and down her tummy. Tummy time - this is very important to develop a baby's neck muscles when they are used to sleeping on their backs. Lie down with him and talk to him or place a mirror in front of him. At first they may only be happy for a minute or two, so stop as soon as baby complains. Baby massage - this is a simple way to bond with your baby and all you need is some oil, for example olive or sunflower oil. It might help to have this demonstrated, so look out for classes running locally, for example at Children and Family Centres, or ask your Health Visitor. Otherwise there are many resources online, for example here at Babycentre. Don't do this just after feeding! Different textures - touch her hands onto different surfaces - smooth, rough, soft, warm (not too warm!) and cool, wet and dry and talk about them. Walk around the house - talk about what you are looking at e.g. family photographs, mirrors, out of the window. Notice what he is most interested in so that you can return for another look. Give her a bath - blow some bubbles, do some gentle splashing. It is more comfortable if you have a baby bath seat or support so that you have both hands free, but of course remember never to leave her unattended. Simple baby yoga - lie him on your lap or on the change mat and gently stretch out and cross over his arms and legs, perform a cycling motion with his legs to help digestion. When baby is a bit older this can be developed further, perhaps by looking for a class locally. Nappy off time - after removing a dirty nappy let her kick on the change mat with no nappy for as long as she is happy. Great to get some fresh air down there, and also gives her the chance to kick her legs and get some exercise. I usually pop an old towel underneath the bottom just in case. Go out for a walk - if he is grumpy, get out for a walk and some fresh air with the pram. If he is not asleep, talk enthusiastically about what you are seeing to keep him interested. "Look! A tree! Trees have leaves!" I hope that this post gives you some ideas if you are struggling with a grumpy baby, I remember those times well and it can be very hard!